Bacon. Roasted tomatoes. Bacon. Fried shallots. Bacon. Tyrion Lannister. Pine nuts. Bacon. Dragons. Avocado. These are the makings of a great night and a great salad. This was a special for the Game of Thrones premier dinner that we throw each year at our house. This year the boys (thanks, Kyle and Simon) decided to grill tomahawk steaks, which are, no joke, the size of my face. So my salad had to stand up to these big beasts. Enter bacon, stage right. 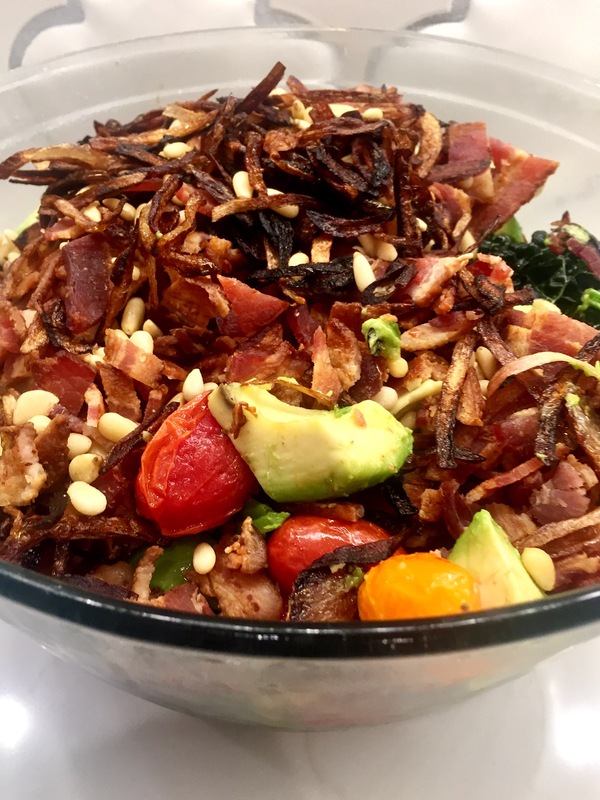 There is just about nothing healthy about this salad, but it’s delicious and perfect for Game of Thrones viewings, summer picnics, impressing your kale-hating friends, justifying bacon in your “diet”, and reminding yourself that the best things in life include bacon. Place bacon on a foil-lined sheet pan and bake until crispy, about 20 minutes, flipping halfway through. Once crispy, place on a towel-lined plate, being careful to make layers of paper towel and bacon so the bacon does not turn soggy. While the bacon is cooking, mix together tomatoes with 1tbs olive oil and a pinch of salt and pepper in a large bowl. Place on a foil lined sheet and bake in the same oven as the bacon until the tomatoes “crack”, about 20 minutes. Wash kale and place in a bowl with lemon juice and a pinch of salt & pepper. Massage kale until it softens, about 3 minutes. Dress with 1/4c olive oil and the balsamic vinegar. In a medium pan, heat the vegetable or canola oil on medium high. When very hot, add shallots and a pinch of salt and pepper. Saute, stirring frequently, until the shallots become a dark crispy brown, about 20 minutes. Be careful to keep shallots spread out on the pan or they will begin to stick together. If the shallots are cooking to quickly or beginning to burn, turn town the heat. Once dark brown, place on a large, paper towel-lined plate, being careful to spread the shallots so they do not stick together. The bacon, tomatoes, and shallots should be allowed to cool. Once cool, cut the bacon into bite sized pieces. Cut avocado into bite sized pieces. 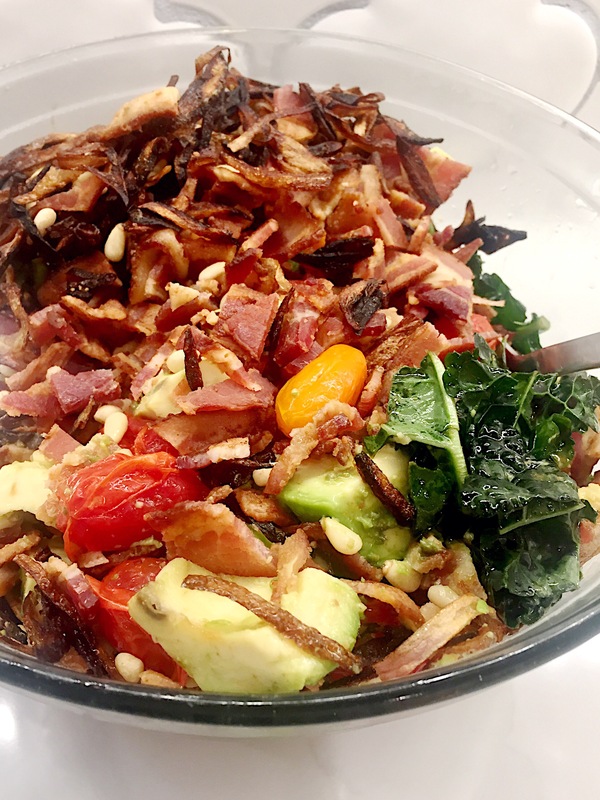 Serve to your very hungry friends as you all watch Game of Thrones together, raving about Daenarys, Arya, the dragons, and just how good this salad is (but not how good this salad is for you).